Boch Automotive began working with Mittcom Auto in 2004. 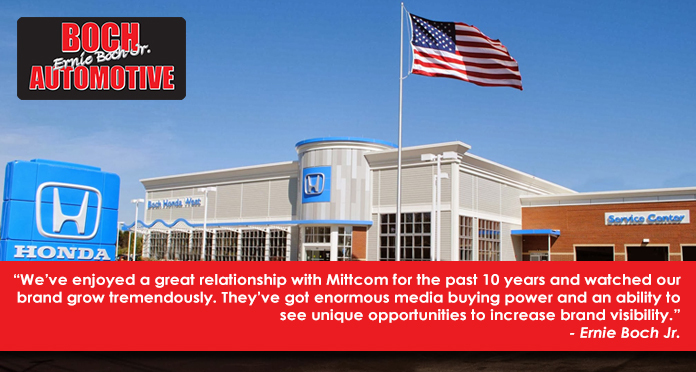 Mittcom Auto has helped grow sales and develop fully integrated marketing strategies for each of their dealerships which made Boch Automotive one of the largest volume dealership groups in the United States. We implement a mixed media approach for each of the dealerships to insure that we are messaging our target consumers in the right place at the right time. Boch Honda #1 Honda dealer in the U.S.
Boch Toyota #3 Toyota dealer in the U.S.
Ferrari & Maserati of New England #3 in the U.S.